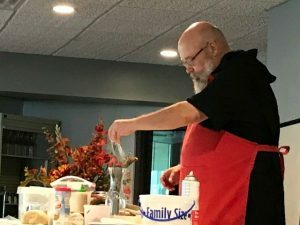 Serenity Hospice was proud to host Father Dominic the Bread Making Monk to a large crowd recently in Rochelle. Father Dom is an award winning cookbook author, children’s author and he had a cooking show on PBS. He lives at the St. Bede Abbey near Peru, IL. Many of the Brothers who live at the Abbey visit hospice patients and offer spiritual comfort. Thanks Father Dom for a great show!